You’ve now become acquainted with all ten characteristics of the spiritual orphan. Maybe you only related to one or two but I will tell you that this would be unusual. Many check off more than a few and some even admit to having all ten. With that realization usually comes panic. “Is this hopeless? Am I too messed up?” I say emphatically no. I speak from experience because I struggled with all ten. That’s where this teaching comes from and I have seen God make changes in me in all areas. Remember that God knows we all come as orphans and he knows what might be our initial posture where He is concerned; a bit withdrawn and suspicious. Those with a difficult life story feel secure only if they stay a safe distance away. They are tucked away behind a wall of mis-trust, even with someone trustworthy. No matter the level of healing that is needed, our Heavenly Father has a plan to win our trust. He slows the pace and calls each of us by name. He knows it takes time to fully trust the love He offers without the slightest reservations. Orphan-ness won’t leave overnight but the healing can begin immediately. He whispers to our spirit within the love language of the scriptures. His Word heals. We begin to understand that God is not like anyone else we’ve ever known, loved, and trusted. Holiness means perfection so God cannot be unfaithful. It’s against His very nature. Not only does He heal with words but He binds up our wounds with non-verbals. “I’ll pour robust well-being into her like a river. You’ll nurse at her breasts, nestle in her bosom, and be bounced on her knees. As a mother comforts her child, so I’ll comfort you.” Isaiah 66:12-13 These are all gestures that don’t require talking. Nestling, bouncing, nursing, comforting. There are times when words aren’t enough but God is not limited in love language. God’s way of reaching you and me will not resemble the way He reaches out to anyone else. We are each unique and so is His plan to scale the mountains to our hearts. No one knows our story better than God and He is the only One who knows how to build a bridge. He is omniscient and can read the mental and emotional pathways of our heart. That would be frightening if it weren’t for everlasting love and kindness. What might I expect as I go on this journey with God? That’s the topic of the next few days. 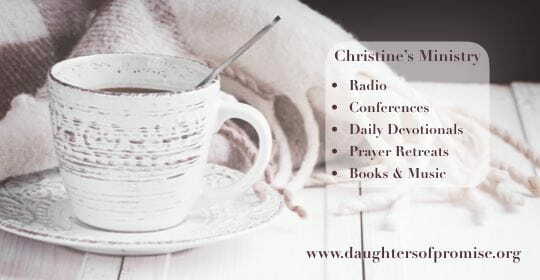 Next week, the real excitement begins as we look at the ten profile characteristics of God’s daughter. We’ve heard the bad news ~ now comes the good.